According to Cy the Cynic, some people never make the same mistake twice. Maybe five or six times, Cy says, but not twice. One error players make repeatedly involves trumps: They try to draw them too soon. 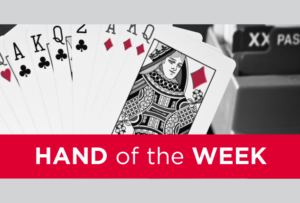 In today’s deal, West led the ♦K against four spades, winning. He continued diamonds, and declarer ruffed the third diamond … and led a trump. Alas for him, West won and led a fourth diamond. South ruffed and led another trump, but when West discarded, the contract was doomed. East had one more trump than South and won the setting trick. South erred by leading a trump too soon, leaving himself open to a forcing defense. He does best to lead a heart to dummy’s queen at trick four, return a club to his nine, pitch dummy’s last diamond on the ♥A and lead a trump. If West wins and leads a fourth diamond, South can ruff in dummy and draw trumps. If East’s trump holding were A-x-x-x, South could still succeed against any defense. 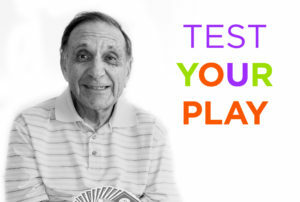 Your partner opens 1♦, you respond 1♠ and he bids 1NT. The opponents pass. What do you say? 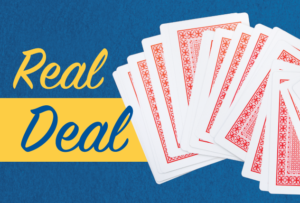 If your partner has three-card support for spades, it’s possible that your winning contract is 4♠. But don’t be a mastermind; make the bid your hand calls for. Raise to 3NT. You have balanced distribution, ample high-card strength for game and honors well dispersed.